If your visiting this page, rest assured, I know that it was by error and that you have little to no interest in those stupid code cards in 2010 Topps Baseball. They are the same thing as the "Topps Attax" fillers, aren't they? I'm actually running a recycling program for the "Million Card Giveaways", all you have to drop them off in my mailbox and I will dispose of them properly. Unfortunately, the "Topps Attax" preview fillers are made from non-recyclable materials. Publicly, people don't seem to care much for the Topps Million Card Giveaway. Privately, they are the hottest thing to hit the hobby in years. Let's just say, no one rips a 1/2 case of Jumbos to put a set together, unless your trying to be the only person on Earth to have pulled each and every "Pie in the Face" short print on your own. If you were actually able to pull this off, I suggest you move on to the Printing Plate set next. If your unlocking cards from the 80's and 90's, try waiting 10-20 minutes to enter your next code card. I've gotten a fair amount of decent 50's and 60's cards doing this. I think that it cycles through the years, either based on Topps' formula or by the volume of people entering. I have gotten better cards doing this, but haven't been able to determine an exact amount of waiting time. I would suggest waiting under 10 minutes if the card you unlocked is from the 2000's. I bought a stack at a card show filled with numbers TMC4-6 and had very little success, a guy I was talking to bought all the TMC1-2, as he had a theory that they opened more 50's and 60's cards. I cannot substantiate his theory, but I can tell you I got not one good card from TMC4-6. Topps will be having contests throughout the season that involve using and trading your cards. Examples: collecting catchers, best 1990's team, and so on based on the cards you have in your collection. You can get "Million Card Giveaway" cards substantially cheaper at a card show than you can on-line. Although, occasionally people list them oddly and a deal can be found. Watch out for people selling "Million Card Giveaway" cards that have been redeemed. On eBay people often put the fact that they have been re-deemed inside the listing. 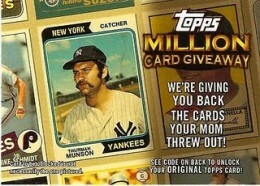 Topps Series 2 will be adding original T206 cards to the Million Card Giveaway. If your patient, you can progressively turn an un-locked $5 card into a $30-$50 card by strategically trading up a few dollars at a time. I turned a $3 card into a $35 card by making 7 trades. If your bored, throw out as many trade offers as humanly possible, chances are someone will accept one. Don't waste your time offering 30-40 80's cards for a 1955 Sandy Koufax Rookie ($1,200), which got over 80 offers, instead try offering those same cards for something attainable ($20-$50) with substantially less trade offers on the table. Here is a hint for everyone. Don’t fall prey to this scam by topps. I received via UPS today my vintage cards i waited for. The card i got from the 1952 topps set had rounded corners and a small crease. What a JOKE!! Topps should have invested money into this. I’m done buying topps cards as well as alot of other people i showed the card to and they couldn’t believe that this is what topps considered a vintage grand prize. @kevin: What card did you win, Kevin? It’s blown my mind how much people are willing to spend to buy the redemption cards considering the fact that they could easily result in cards worth less then a cent (87 Topps). I received the 1952 topps #122 Jackie Jensen. And your right it wasn’t any better then getting a 87 topps cards. I’m not the only one thats a little upset about this promotion. Haven’t bought a box or a pack since i received the card. The best part Topps insured it when they sent it to me by UPS. Thanks for the insight Kevin, I haven’t redeemed any of mine yet and after hearing this, I certainly won’t be buying any more code cards. I assumed that they would be finding ones that were in good condition and could be sold to people trying to put together high quality condition sets. I have unlocked a card that says This Card Unavailable 1956 and then for cards related to it at bottom of page it has 1909 willie keeler T206 card along with many other 1909 T206 cards . I can’t see how any cards in the 1956 set would be related to the 1909 T206 cards, so either I am getting a T206 or a 1956 card. Showing so many 1909 cards that are related to the card I unlocked,I would think I must be getting a T206 since those are the only related cards listed ? I did get the code card from a 2nd series pack so hopefully it is a t206.The T206 cards they showed had stains and creases on them so maybe that is what I will get,subpar junk quality cards and not something mint from their so called vault ? Alot of these cards are miscuts, off center, and in generally rough condition. I got a 1961 card that has a number 2 written in pencil on it. Nothing you could really star a set with. Dissapointed. So it turns out these “REALLY” are the cards your mom threw out! Topps has been keeping an eye on garbage heaps around the country so that they may recover the trashed cards and resell them to you through the Million Card Giveaway of 2010. Brilliant!! I received a Series I pack of 1972 Topps. It was pictured I won a pack of 1988 Topps, I was happy to find it was not them! 8>O SO-O-O-O HAPPY…………….. I stoped investing in the TOPPS brand, after the ’88-89 disappointment !! THANK-GOODNESS, U.Dk. came around !